The Trump administration’s move to open nearly all of America’s coastal waters to offshore oil and gas drillingwould give energy companies access to more than a billion acres off the Atlantic, Pacific and Arctic coasts. Mr. Trump’s plan upends a decades-long effort to balance the nation’s energy needs with protecting ocean ecosystems, and it is meeting stiff resistance from governors up and down the coasts. Secretary of the Interior Ryan Zinke announced on Jan. 9 that Florida was off the table after meeting the state’s governor, Rick Scott. But 10 days later, a senior Interior official appeared to contradict Mr. Zinke, telling a congressional hearing that the secretary’s decision was not final. Other states are also seeking exemptions. The California attorney general, Xavier Becerra, a Democrat, has asked why the Trump administration felt Florida’s coastline was valuable enough to preserve, but not California’s. The Republican governor of South Carolina, Henry McMaster, has also asked the Trump administration for a drilling exemption, citing the risks that oil and gas would pose to the “unspoiled beauty” of his state’s beaches. 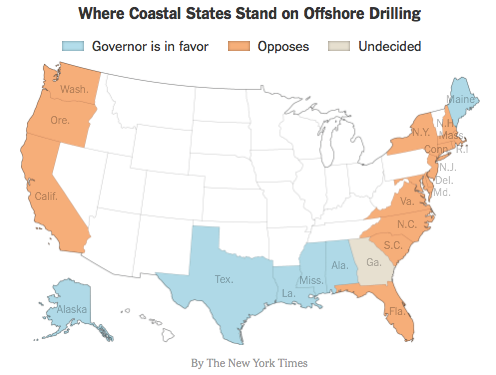 All told, at least 15 governors of coastal states, one-third of them Republican, have publicly opposed Mr. Trump’s offshore drilling plan. How did we get here, and what’s at stake? 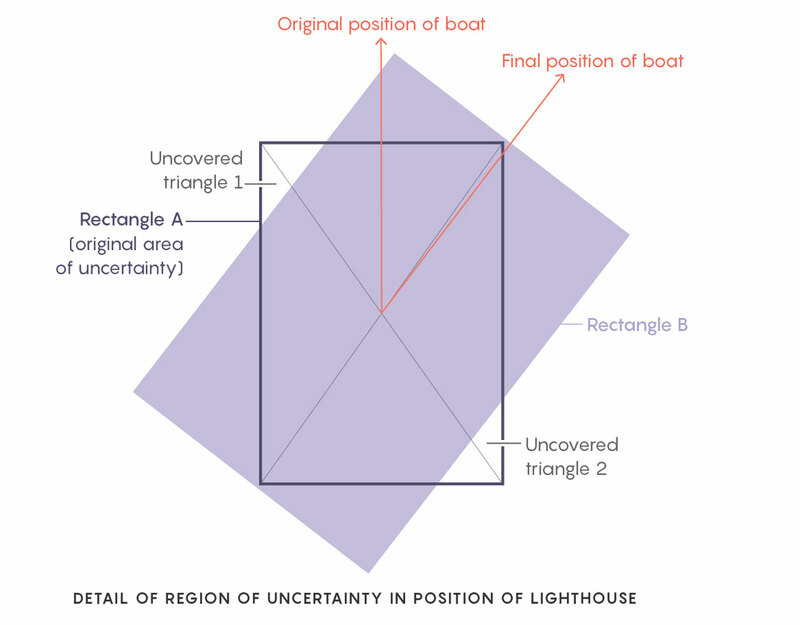 Most coastal states control leasing off their shorelines out to three nautical miles. At least 200 miles beyond that, the federal government owns the seabed and its mineral resources — some 1.7 billion acres’ worth. 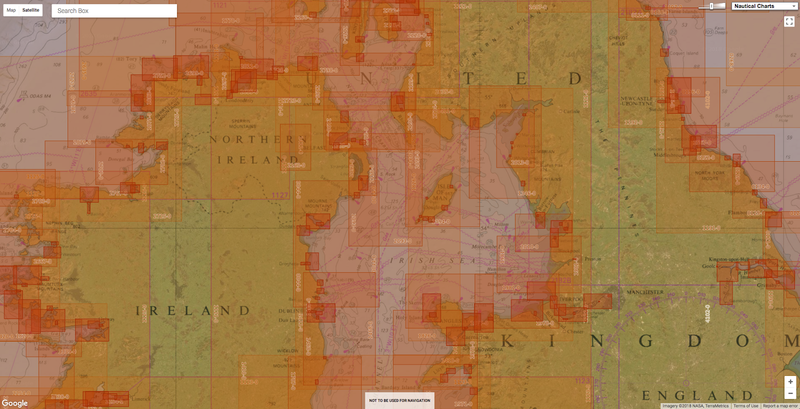 The Department of the Interior parcels out offshore leases in those areas under five-year plans. Both Congress and the president also have the authority to impose protections and moratoriums that render areas off limits to leasing. The oil-rich western and central parts of the Gulf of Mexico have been open to drilling for decades, while other areas have been withheld from leasing or protected under moratoriums and other protections. And each of the last three presidents has had differing ideas about how to parcel out leases. 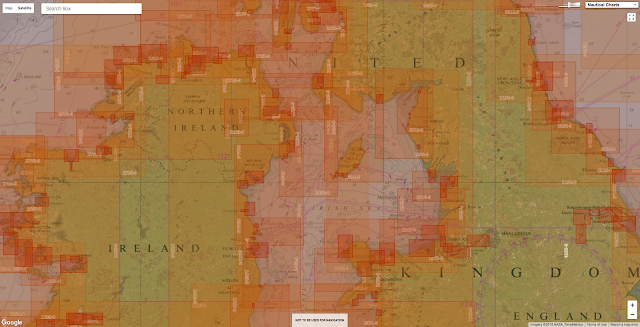 These three maps break down the changing status of the offshore zones: Areas open to drilling leases, areas not yet open to leases, and areas under protection, where leases are prohibited. 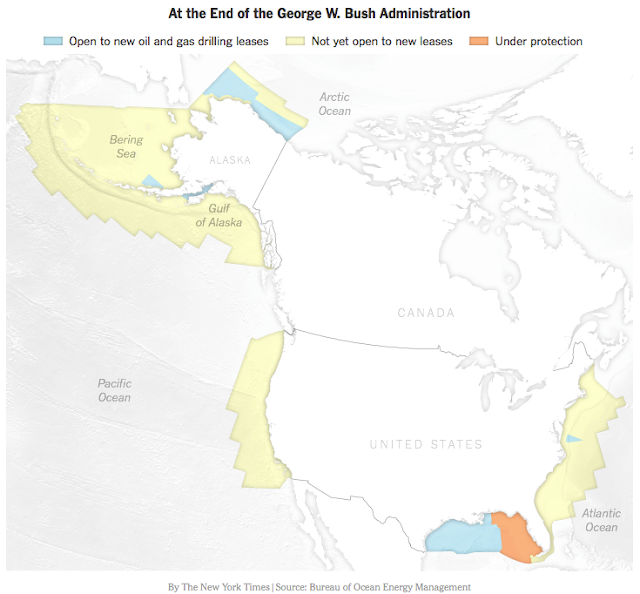 President George W. Bush opened up new areas to offshore drilling for the first time in decades when he lifted a longstanding moratorium on new drilling off much of the nation’s coasts. At the same time, a bill passed by Congress in 2006 allowed new drilling in some parts of the Gulf of Mexico but banned drilling in most of the eastern Gulf until 2022. 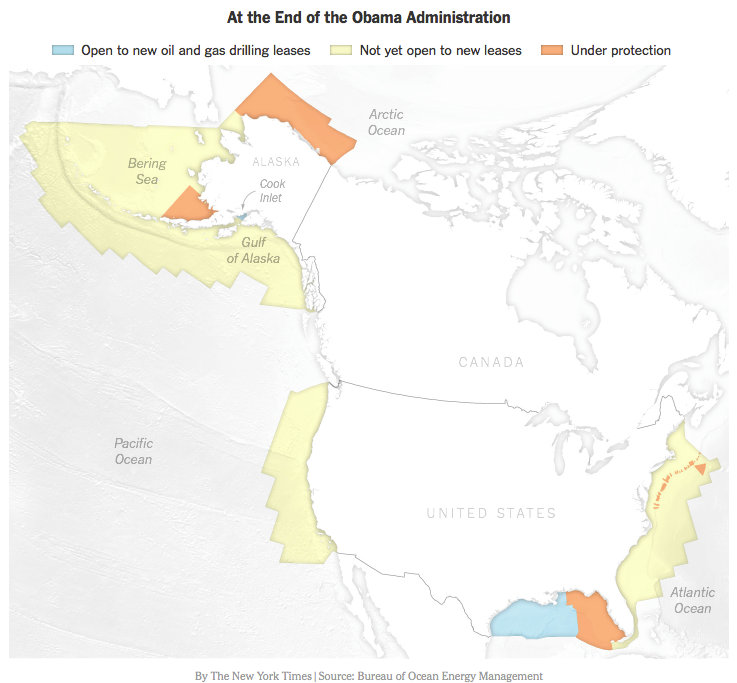 Much to the chagrin of environmental groups, the Obama administration initially said it would also expand offshore drilling and allow new leases off the Atlantic coastline, parts of the Gulf and the north coast of Alaska. However, the 2010 Deepwater Horizon oil rig disaster, which killed 11 people and caused the worst-ever oil spill in American waters, triggered a reversal of Mr. Obama’s plans. In the final weeks of his administration, Mr. Obama called for what he described as a permanent ban on offshore oil and gas drilling along wide areas of the Arctic and the Atlantic Seaboard, a move meant to bolster his environmental legacy. President Trump’s proposal seeks to reverse that legacy. Under its new plan, the Interior Department would open 25 of 26 regions of the outer continental shelf to drilling. That would leave only the North Aleutian Basin, the traditional territory of many Native Alaskans and home to one of the world’s biggest salmon runs, off limits to drilling. The eastern Gulf would also remain out of bounds until 2022 because of the 2006 moratorium. But after that it, too, could be opened to drilling under the Trump plan. Separately, drilling is banned within about 600,000 square miles of marine and Great Lakes waters designated as marine sanctuaries or monuments. 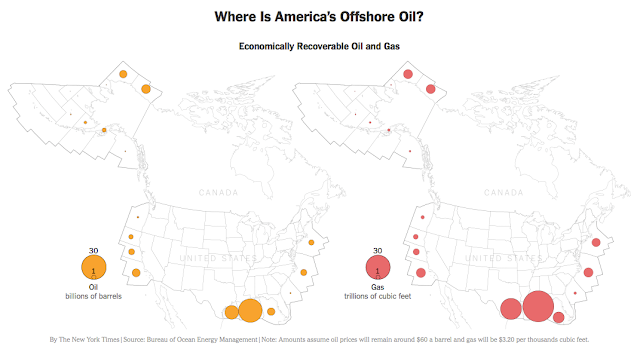 Just how much oil lies off America’s coasts, and how much drilling could actually happen? 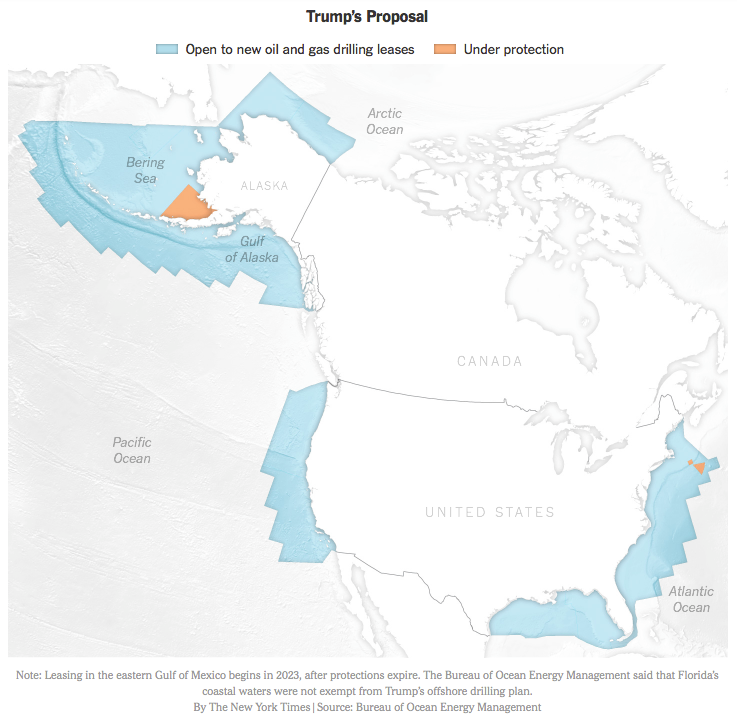 The Bureau of Ocean Energy Management, which manages offshore leasing, estimates that the areas opened up to drilling under Mr. Trump’s plan hold nearly 45 billion barrels of oil, of which 21 billion barrels would be economically recoverable assuming oil prices remain around $60 a barrel. While those are large amounts, there are significant oil reserves still to be found in the western and central Gulf, which are already open to drilling. There, some 45 billion barrels of oil reserves are up for grabs, of which 37 billion barrels could be produced economically at current oil prices. Stated another way: Almost two-thirds of the nation’s oil reserves that companies can hope to drill for while still turning a profit lie in seas already open to drilling. Meanwhile, there’s little recoverable oil and gas in the South Atlantic or the Straits of Florida, or off the Washington and Oregon coast, or off Alaska outside the north shore. The abundance of cheap oil and gas from onshore fracking in the United States has already diminished the incentive for companies to go drill in new offshore zones. Given the risks and costs of building wells in seas that have seen little development to date, not to mention the possibility that a new administration could again change offshore policy down the road, analysts don’t expect a rush into newly opened waters soon. Newsweek : Will Trump's Oil Drilling Mistake Cause Another Deepwater Disaster? On Wesnesday, Humanity will be treated to a celestial trifecta: A supermoon (meaning it’s relatively close to Earth), but also simultaneously a blood moon (it’ll be orange or red), but also simultaneously a blue moon (the second full moon in one calendar month) will pass in the shadow of Earth, for a total lunar eclipse. It’s going to be righteous. But supermoon? Blue moon? Blood moon? Yeah, let’s go ahead and pump the brakes on those terms, because the first was created by an astrologer, the second is highly subjective, and the third was only recently popularized by this-must-be-prophecy types. First, some basics on the grand astronomical event. 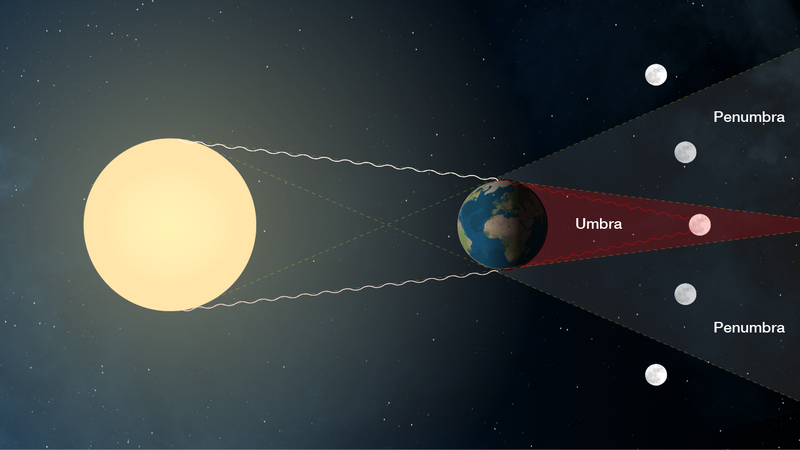 A total lunar eclipse is, of course, when the moon passes through the shadow of the Earth. But the Earth doesn’t actually cast one super-delineated shadow. There are two components: the penumbra and umbra. “The reason there are these two portions of the Earth's shadow, umbra and penumbra, is because the sun is not a single small point, it's got this big disk,” says Noah Petro, a research scientist at NASA’s Goddard Space Flight Center. So the penumbra is more a partial shadow, caused by a portion of the sun being blocked by the Earth. You can see that light sneaking through in the penumbra. If you glimpse the moon when it’s there, it still won’t have the reddish or orangish or brownish hue it takes on during the so-called blood moon. “Only once it passes completely into the Earth's umbra does it turn that red color, and the reason for that is because it's very, very dim,” says Petro. That bizarre color comes from Earth itself. As sunlight passes through our atmosphere, it interacts with particles like dust, scattering certain colors. Specifically, blue, which has a shorter wavelength. Red and orange with their longer wavelengths will pass right through. 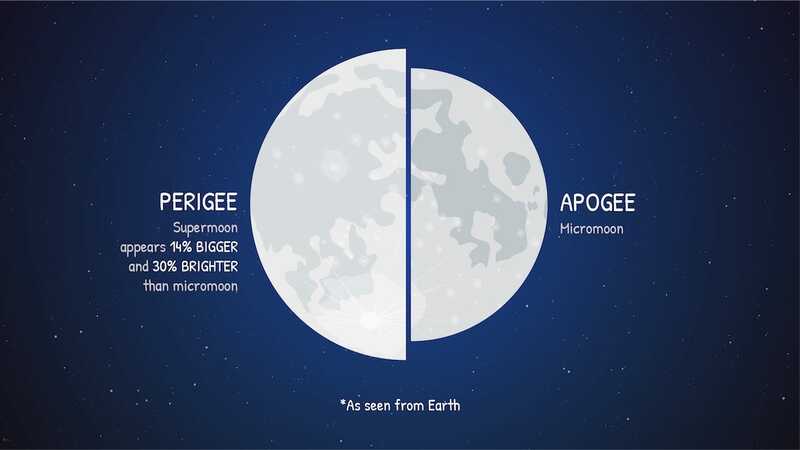 It's nearly impossible to compare the apparent size of the supermoon with a micromoon from memory, but when seen side-by-side as in this graphic, it becomes clear. Think about the different kinds of light you see here on Earth. We get blue skies during the day because when sunlight hits us head on, the blue light scatters toward us. “When we have a sunset, the sunlight is going through a thicker portion of the Earth's atmosphere, and so more of the blue light is scattered away,” says Petro. Thus the reds and oranges of a particularly magnificent sunset. Nicknamed "blood moon," some ancient cultures regarded a total lunar eclipse as an ominous event. Today, this celestial phenomenon generates excitement and wonder. Unlike a solar eclipse, which may require travel to see, total lunar eclipses can often be observed from the entire nighttime-half of the Earth. Learn what causes a lunar eclipse and how it gains its crimson coloring. So we’re going to have ourselves a “blood” moon. “I think the term more recently, really in the last decade or so, has become popular by these religious zealots that keep proposing that it's the end of time and this lunar eclipse is going to be the last one,” says Fred Espenak, scientist emeritus, also of NASA’s Goddard Space Flight Center. Indeed, take a look at the Google Trends of “blood moon” below. “The term has been around for centuries, but in obscure texts,” Espenak adds. “Even the Bible says something about a blood moon. But that's open for interpretation exactly what that means.” It could have been a lunar eclipse, sure, or some kind of phenomenon that turned the moon red. Forest fires, for instance, or a volcanic eruption that burped particulates into the atmosphere. A lunar eclipse, super moon and blue moon are about to happen at once. The recent emergence of the term probably came from the book Four Blood Moons: Something Is About to Change by the pastor John Hagee, according to Bruce McClure and Deborah Byrd over at EarthSky. The big thing that’s about to happen is a magnificent total lunar eclipse. “I think using these terms like ‘blood moon’ just obfuscates exactly what is going on, and it just perpetuates some of the superstitions surrounding this sort of stuff,” says Espenak. and how the phenomenon got its name. Speaking of superstitions, the next part of the celestial trifecta, the supermoon, is kinda problematic as well. “The history of the ‘supermoon’ is not of astronomy,” says Petro. “The first person to define a supermoon was an astrologer, and of course that gives us heartburn.” Specifically, an astrologer named Richard Nollelle, who claimed that the supermoon could impact the weather. Virtual Telescope : 31 Jan. 2018 Super Blue Moon Total Eclipse and “SuperBlueMoon 2018” – live events, online! The ocean is at a tipping point. Can new technology come to the rescue? The ocean represents 99% of the living space on Earth. It provides livelihoods and nourishment for more than 3 billion people, and brings $3 trillion into the global economy each year. Yet, for all of human history, the ocean has been largely out of sight and, as a consequence, largely out of mind. We have been able to see very little of what’s happening in the water, or even on the surface. 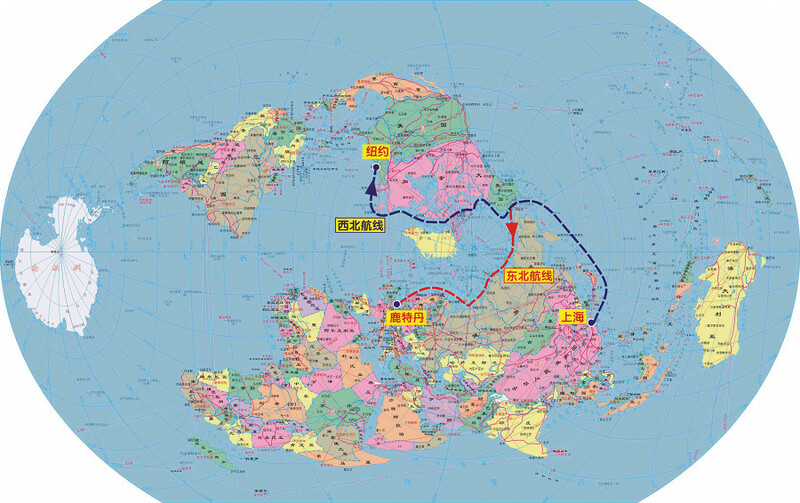 We have been blithely confident that the ocean is inexhaustible; able to provide all the fish we can catch, and absorb all the waste we produce. But today the ocean is coming into view with startling rapidity. 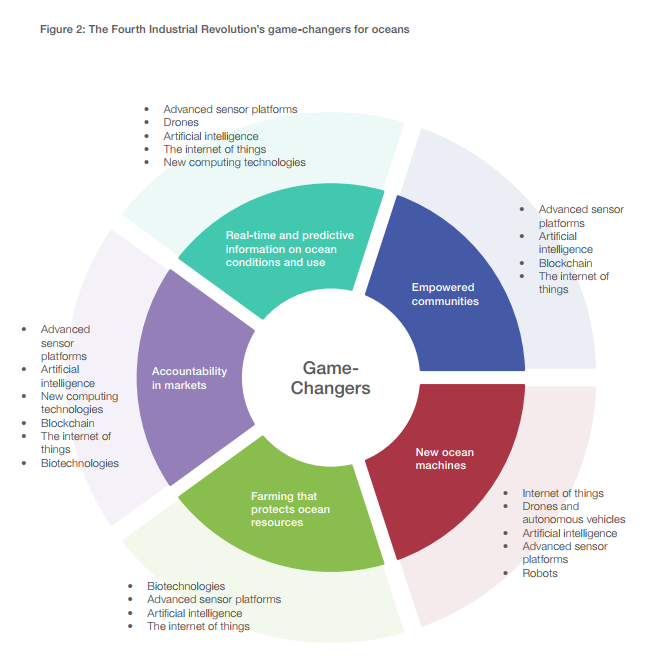 New technologies powered by the Fourth Industrial Revolution (4IR) are creating an information revolution that will transform our relationship with the ocean. A rapidly proliferating array of advanced sensors - carried by fleets of satellites, ocean-going drones, fishing nets and even surfboards - is producing a flood of new data. New analytical techniques, such as machine learning and artificial intelligence, translate this flow of data into streams of understanding, providing powerful new tools for governments and communities to manage ocean resources - all in a process transparent enough to create new accountability for resource users and businesses. These capabilities arrive not a moment too soon. The ocean is in crisis. 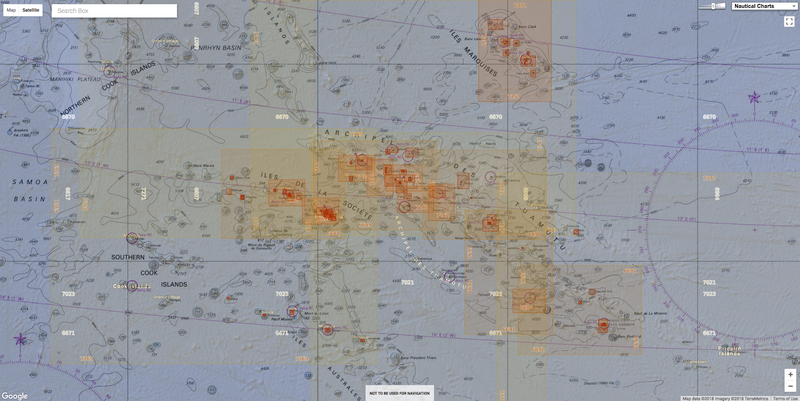 Most of the world’s fisheries have been fished to the limit or beyond. The ocean has mitigated our impacts on the climate – absorbing 30% of our CO2 emissions and 90% of the excess heat we have produced. But the result is that we are making the ocean warmer and more acidic. In 2015 and 2016, record global temperatures drove global bleaching across 70% of the world’s coral reefs. Fertiliser running off our farm fields has created more than 400 dead zones in estuaries and coastal waters. 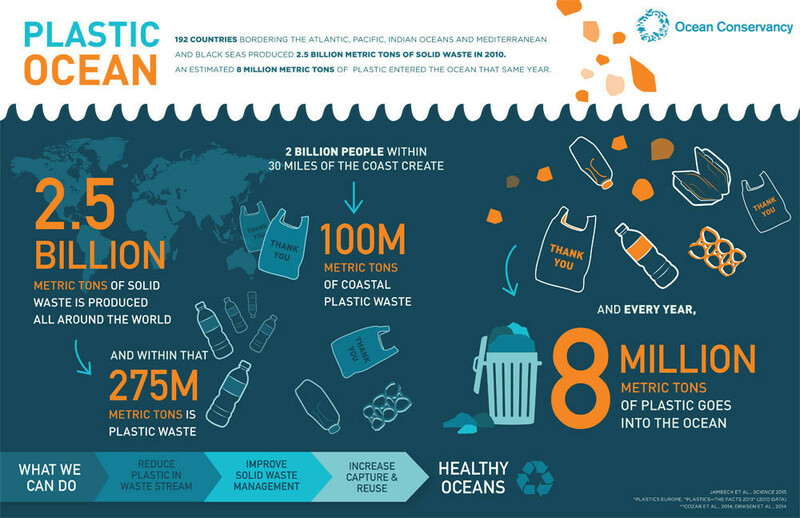 And each year we dump 8 million tons of plastic into the ocean; it is estimated that by 2050 there will be more plastic in the ocean than fish. In the UN’s Sustainable Development Goals (SDGs), governments have agreed on an ambitious global agenda to address this crisis. SDG 14 sets out a wide-ranging set of targets for better stewardship of ocean resources – including better management of fisheries, large and small; protection of key marine resources; and sustainable development for the Small Island Developing States (SIDS). Success will require bold action by governments, communities, companies and civil society. Harnessing the power of the Fourth Industrial Revolution will be essential. New technologies can help governments better manage their fisheries. Ocean-going drones can cruise the ocean for a year at a time, offering a cost-effective solution for assessing fish stocks and patrolling remote areas. Real-time reporting allows dynamic management of fishing to reduce bycatch of protected species. Facial recognition technology can even be used to automate the tracking of catch – identifying every fish as it lands on the boat. New technology creates new possibilities for small-scale fisheries as well. Smartphone apps can deliver information on weather, fish stocks, and market prices, and provide a platform for fishers to collect data on where they’re fishing and what they’re catching, helping them to achieve and demonstrate sustainability and access new markets. 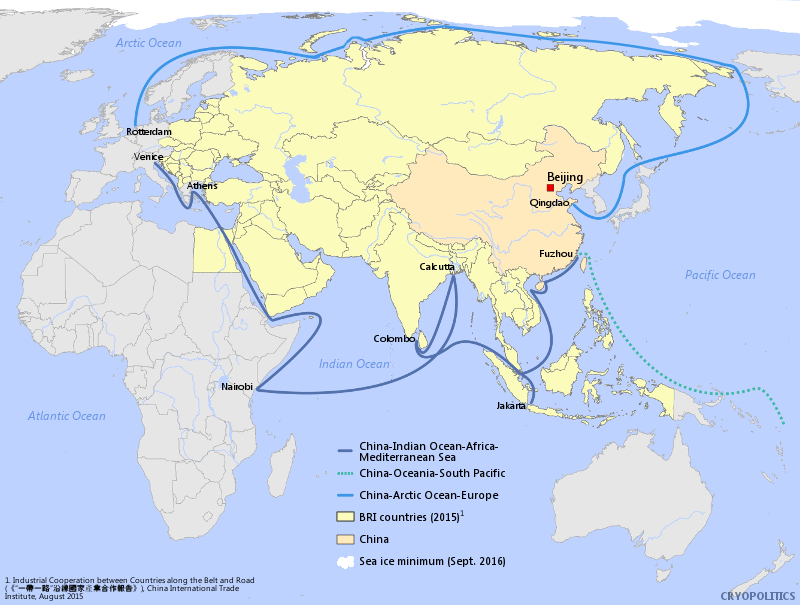 As governments redouble their efforts to protect critical marine areas, 4IR technology strengthens their ability to make those protections stick.Satellites now track the Automatic Identification System (AIS) transponders that must be carried by all big boats. Three initiatives are now combining AIS data with other datasets and machine learning to monitor fishing and other activities, enabling countries to monitor all the waters within their 200-mile limit. In 2015, for example, the Pacific island nation of Kiribati used Global Fishing Watch to snare a fishing vessel operating illegally in the Phoenix Islands Protected Area, and collect a $2 million fine. These capabilities provide new opportunities for sustainable development in SIDS, whose economies depend on a healthy ocean. They allow these countries to monitor and regulate their own fishing fleets, as well as the foreign fleets who license the right to fish their waters or who fish as pirates. More broadly, they allow them to monitor ocean conditions to help sustain the health of their ocean ecosystems. The history of technology in the ocean gives cause for caution. Too often, technological advances – more powerful fishing gear, ever-deeper oil drilling, industrial agriculture – have accelerated depletion and pollution. As innovation enables even more intensive exploitation, the weaknesses of current governance are thrown into sharp relief. The 4IR thus demands strong action both from the governments who own the resources and from the governments whose companies would exploit them. Success will require a commitment to flexibility – to open up entrenched management regimes to take advantage of the tools now becoming available – for dynamic management of resources, more effective law enforcement, and better understanding and control of risks. It will require a willingness to allow managers and communities to experiment with new capabilities in order to find better ways of managing their resources. Most importantly, harnessing the power of the 4IR will require an openness to collaboration between a wide range of actors – allowing fishers and other resource users, NGOs, companies, communities and consumers to find creative ways to use new technology to create new solutions. With flexibility, and all hands on deck, the 4IR can be a powerful resource in achieving SDG 14, and sustaining the ocean resources that are vital for our future. A video illustrating how one idea completely transformed the modern-day shipping industry. The container shipping industry is booming and companies are moving cargo around the world faster than ever. This video explains the simple idea that transformed the industry and where it’s headed next. Container shipping underpins the global economy, moving $4 trillion of goods every year, from clothes and electronics to food and heavy machinery. It took one idea in the mid 20th-century to revolutionize the industry and ignite a spark in globalization that changed the world. At times, it’s been a rough sailing. The industry has faced criticism for too many ships in the water and from those who say it’s responsible for around a quarter off the world’s nitrogen oxide pollution. This video details the history of container shipping through the centuries, how it revolutionized global trade, and where it’s headed next.